A broad spectrum of U.S. adults had lower numeracy scores than their international counterparts, a new federal report shows. In addition, the gap in literacy and numeracy skills between U.S. adults who lacked a high school diploma and those who obtained at least an associate’s degree was wider than for any other participating country. The report was released on September 19 by the National Center for Education Statistics (NCES), which examined scores on the Program for the International Assessment of Adult Competencies (PIAAC) conducted from 2011 to 2012. 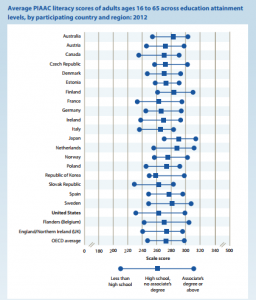 The assessment evaluated performance for literacy and numeracy among adults ages 16-65 in 22 developed countries. Results from a 2013 report from the center had previously shown that American adults scored lower than international literacy and numeracy averages. The average literacy score on the assessment was 273 points, while the United States’ average was 270. Regarding numeracy, the U.S. average score was 253 points compared to the international average of 269. The comparisons highlighted in the brief are statistically significant, the report’s authors indicate. In their examination of data collected from the 2012 PIAAC, analysts from the American Institutes for Research and Activate Research, Inc. identified the considerable influence of education attainment on literacy and numeracy scores. The average literacy score for American adults with at least an associate’s (298 points) did not significantly differ from either the international average (297 points) or averages of the 21 other participating countries. However, literacy scores differed significantly for U.S. adults with only a high school diploma (262 points), or those who had not graduated high school (230 points). Both groups scored well below the averages for their international peers at the same levels of education (272 and 246 points, respectively). Regarding numeracy, U.S. adults at each of the three recorded levels of education attainment had lower results than averages for the rest of the developed world. American adults ages 16-65 without a high school diploma had an average score of 204 points on the PIAAC. U.S. adults who were high school graduates scored an average of 243. Finally, Americans with at least an associate’s degree averaged a numeracy score of 287 points. By comparison, the international averages at each level of education attainment were 237, 268, and 296 points, respectively. Who’s Consistently Outperforming the U.S.? Average literacy scores for U.S. adults with no high school diploma fell below results for almost all countries at that level of education attainment, including the Czech Republic, Finland, Germany, Japan, Sweden, and the United Kingdom. Literacy performance for U.S. adults who had not graduated high school was not measurably different from four other countries and the U.S. average of 230 points was higher than Spain’s 228. American adults who had graduated high school scored higher than Poland’s low average of 258 points and lower than their peers in most other countries, except for three, where scores were not measurably different. For Americans with at least an associate’s degree, the comparison was more balanced. The average score of 298 for U.S. adults was higher than eight other countries, including Canada, Italy, Spain, and South Korea. The average literacy score for U.S. adults who had attained higher education was lower than that of eight countries, including Australia, the Czech Republic, Finland, Japan, the Netherlands, and Sweden. Additionally, the U.S. average was not measurably different from six nations (Austria, France, Germany, Poland, the Slovak Republic, the United Kingdom). 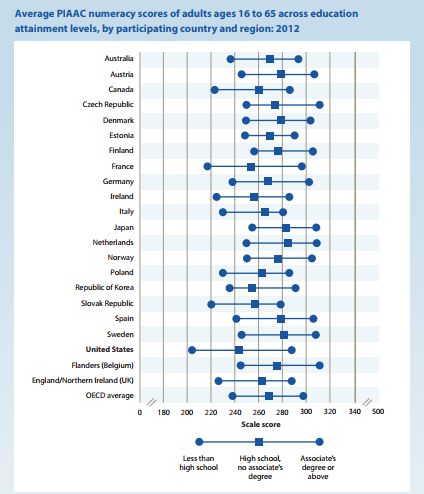 Concerning numeracy scores on the assessment, U.S. adults at each level of education attainment were outperformed by almost every other developed nation. 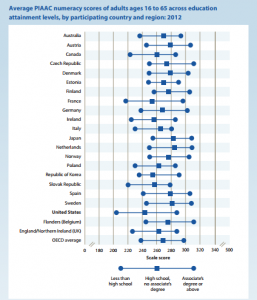 American adults without a high school diploma scored lower than all participating countries at that education level. 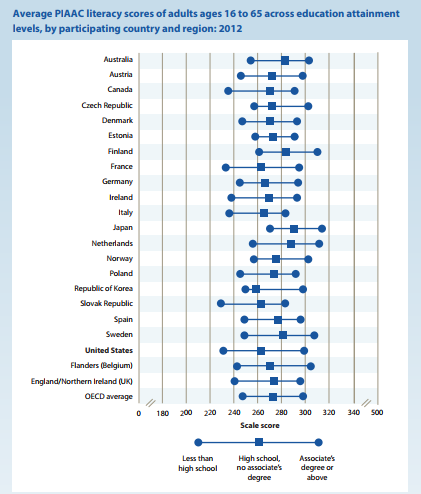 U.S. adults who had graduated high school also scored lower numeracy averages than all participating countries. U.S. adults with an associate’s or above scored lower than their peers in numeracy in 14 other countries. Americans with at least an associate’s had higher numeracy scores than Italy (280) and Spain (278), and their scores were not measurably different from five countries. Adults who did not finish high school in seven participating countries, including Austria, Finland, and Japan, had higher average numeracy scores than U.S. high school graduates. U.S. adults had the widest scoring margins in literacy and numeracy (67 and 83 points, respectively) of any developed country, between individuals with the lowest (less than high school) and highest levels (associate’s degree or above). This finding excepted France, where gaps were not measurably different. Literacy and numeracy score gaps for U.S. adults in their 20’s between individuals with the lowest and highest levels of education were especially pronounced. The United States had larger average score gaps than 12 out of 22 countries in both domains, with differences in average scores measuring 79 points for literacy and 93 for numeracy. The overall literacy and numeracy averages were 59 and 65 points. Score gaps for American adults in their 20’s between individuals who had not finished high school and those who had at least an associate’s degree were larger than those for all U.S. adults (79 versus 67 points for literacy; 93 points compared to 83 for numeracy). For U.S. adults in their 20’s, score gaps in literacy and numeracy between individuals with a high school degree and non-graduates were far wider than those for all U.S. adults (45 points for young adults versus 31 for all adults in literacy; 54 points for young adults compared to 40 for all U.S. adults in numeracy). In contrast, the scoring differences between high school graduates and those with at least an associate’s degree, for all U.S. adults and young American adults, were not measurably different, the researchers found. Leo Versel is an editorial intern for Education Week and EdWeek Market Brief.